If you are a bit overweight or obese, there is good news! The US FDA has approved a powerful new weight loss medication that works differently than the conventional weight loss medications and has better results compared to most other weight loss medications – it is called Saxenda (liraglutide). 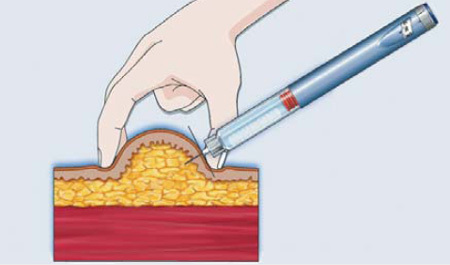 Previously approved for patients with type 2 diabetes, under the brand name Victoza at a lower dosage of 1.2 mg and 1.8 mg, Saxenda is a subcutaneous injection at a dose of 3 mg administered through a pen (similar to insulin pen). Approved for anybody with a body mass index of 27 or over with at least one weight related co-morbidity or those with a body mass index of 30 even without any comobidity, Saxenda offers a new tool to the weight loss doctors to assist their patients fight the epidemic of obesity. In addition to diet and exercise, Saxenda can help reduce insulin resistance – a key underlying process that plays a central role in causing the weight gain. Unlike the traditional weight loss medications most of which tend to help one lose weight by increasing the metabolism, Saxenda belongs to a class of medications popularly known as GLP-1 agonists (Glucagon Like Peptide) or incretins. Other medications in this group include the diabetes medication, Exenatide(marketed as Byetta, Buduereon), Abiglutide (marketed as Tanzeum, once a week dosing). Why the new urgency in approving new weight loss medications? Prior to 2011, for a period of 10 years, no new weight loss medications were approved as the FDA kept denying all the NDA applications for weight loss medications on some pretext or the other while the nation has been getting heavier and heavier. Also, the FDA panel of experts, apparently did not have a single bariatric medicine physician prior to this time. Having realized the need for having a weight loss physician(bariatrian) on its panel, FDA took a bariatrician on its panel at around 2011 and we now have 4 new weight loss medications – Qsymia, Belviq, Contrave and Saxenda all approved in the last 3 years. Used responsibly in combination with a healthy lifestyle that includes a reduced-calorie diet and exercise, Saxenda provides an additional treatment option for chronic weight management for people who are obese or are overweight and have at least one weight-related comorbid condition. Multiple studies have demonstrated efficacy and safety of Saxenda. In the pivotal research study looking at the effectiveness of Saxenda for weight loss with about 4,800 obese and overweight non-diabetic patients with and without significant weight-related conditions, about 62% of patients had a weight loss about 4.5 percent or more from baseline compared to treatment with placebo (34%) at one year. This is remarkable since most of the other weight loss medications currently on the market are slightly less effective than Saxenda in the results. All these patients received counseling regarding lifestyle modifications that consisted of a reduced-calorie diet and regular physical activity. In a separate trial, in patients with type 2 diabetes showed that patients had an average weight loss of 3.7 percent from baseline compared to treatment with placebo at one year. In this trial, 49 percent of patients treated with Saxenda lost at least 5 percent of their body weight compared with 16 percent of patients treated with placebo. Patients using Saxenda should be evaluated after 16 weeks to determine if the treatment is working which is the same for most weight loss medications including the other new weight loss drugs such as Contrave, Belviq, Qsymia etc. If a patient has not lost at least 4 percent of baseline body weight, Saxenda should be discontinued, as it is unlikely that the patient will achieve and sustain clinically meaningful weight loss with continued treatment. Saxenda has a boxed warning stating that tumors of the thyroid gland (thyroid C-cell tumors) have been observed in rodent studies with Saxenda but that it is unknown whether Saxenda causes thyroid C-cell tumors, including a type of thyroid cancer called medullary thyroid carcinoma (MTC), in humans. Saxenda should not be used in patients with a personal or family history of MTC or in patients with multiple endocrine neoplasia syndrome type 2 (a disease in which patients have tumors in more than one gland in their body, which predisposes them to MTC). This concern is a minor concern given the very minimal and extremely rare risk in animal studies and the lower dose of the same medication, Victoza, has been extremely popular among diabetics! Some of the serious side effects reported in patients treated with Saxenda include pancreatitis, gallbladder disease, renal impairment, and suicidal thoughts. Saxenda can also raise heart rate and should be discontinued in patients who experience a sustained increase in resting heart rate. In clinical trials, the most common side effects observed in patients treated with Saxenda were nausea, diarrhea, constipation, vomiting, low blood sugar (hypoglycemia), and decreased appetite. Saxenda is manufactured by Novo Nordisk A/S, Bagsvaerd, Denmark and is distributed by Novo Nordisk, Inc. Plainsboro, New Jersey. W8MD Medical Weight Loss Centers of America’s physicians are familiar with use of Saxenda and other weight loss medications and offer this valuable tool in addition to diet and exercise for eligible patients. See the current W8MD locations on the main W8MD weight loss locations page. NYC Weight Loss Center: 2003, Bath Avenue, Brooklyn, NY, 11214 Ph: 1-718-946-5500. W8MD medical weight loss program at Vida Sleep Center of Dr. Felix Roque’s office at 543, 45th Street, Union City, New Jersey. 543 45th St, Union City, NJ 07087. Phone: (201) 766-6469. This center bills out of network for insurance. Does insurance cover Saxenda for weight loss? Although it depends on your plan and coverage, some insurances are beginning to cover the powerful new weight loss medication, Saxenda to assist in weight loss for those that are obese. As one of the very few weight loss centers to accept health insurance for weight loss physician visits, W8MD medical weight loss centers of America can offer Saxenda as one of the options for weight loss in addition to diet and exercise! If you are interested in Saxenda or any of the other weight loss medications such as Belviq, Contrave, Qsymia, Adipex or Phentermine, Phendimetrazine etc, call us today at 1-800-W8MD-007 for a consultation with one of our weight loss doctors! As we do accept most insurances for these weight loss visits, what have you got to lose besides your unwanted pounds?